Freechoice: Explore Catherine’s Block and the fountains in the Lower Garden at Peterhof on a guided tour, or be seduced by the sheer extravagance of Peterhof’s Grand Palace, which was modelled on the Palace of Versailles. 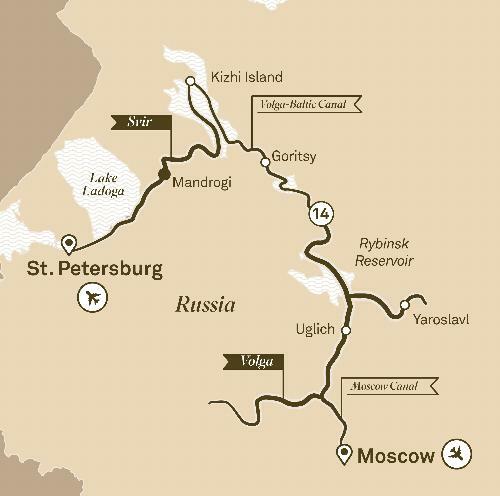 Alternatively, wander the incomparable Upper and Lower Gardens at Peterhof, including the Palace’s majestic fountains. Following lunch in a local restaurant, enjoy a cruise through the city’s canals and get to glide under some of the city’s 400 bridges. Enjoy a highlight lunch at the old-world wooden Podvorie restaurant. Here you’ll be offered traditional Russian cuisine where the delicious fare is home-grown at the restaurant owner’s private summer residence. This afternoon enjoy free time to explore or relax as you please. This morning visit the Hermitage, formerly the Winter Palace and home to the Tsars. Today it houses one of the world’s most magnificent art collections. Start your day by seeing the city’s finest sights. Then, take an insightful ride on Moscow’s Metro, which is guaranteed to surprise you. In fact, it’s considered one of the best subway systems in the world.